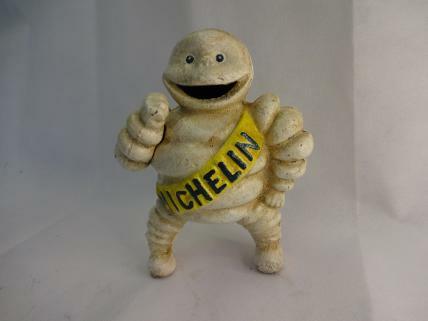 Cast iron Michelin Man moneybox. Sometimes also known as a "bank", this moneybox is painted in antique white and finished with the iconic yellow "Michelin" sash. Coins are inserted into the moneybox via the Michelin Man's mouth. Great novelty item which is loved by vintage auto enthusiasts and savers alike.